Our Editor-in-Chief is back… and, as usual, he sounds off on something that bugs him. 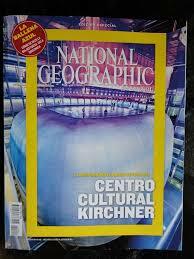 So, I was recently dismayed to learn that National Geographic has issued a Special Edition in Spanish about the Nestor Kirchner Cultural Center in Argentina. On the surface, this would seem to be reasonably aligned with National Geographic’s mission. After all, on their website, National Geographic says that they want to inspire, illuminate and teach. But (there always seems to be a “but” in these things, doesn’t there…) it isn’t quite that simple. You see, this latest supplement is not a simple article about a cultural center that many people in the Spanish-speaking world are likely to be interested in. This, as so ably chronicled by La Nación, Argentina’s most respected newspaper, is a particularly crass pandering to media dollars by the society in a critical election year in that South American country. The cultural center is not just named after the current Kirchnerist government’s founder, but is also a monument to their belief that an ideal world can only be reached through their particular continuation of Mussolini’s old ideas, reinforced with concepts of isolationism, populism and certain elements of postmodern socialism. Of course, it can be argued that a democratic country’s culture is well-reflected by its government, so the supplement is a valid informative piece – except for the fact that just a month before it hit the streets, 60% of Argentina’s population voted against the Kirchnerist government in an obligatory presidential first round election. Even if the population hadn’t expressed its desire to find a different, more modern road forward, the supplement itself reads like a political manifesto written by a virulent opposer of free market economics (which is weird, because the last time I checked, the Society was based in a somewhat non-socialist country), savagely criticizing what many feel to be the last true era of modernization in the country. We’ve sounded off against the sheer barefaced destruction of the truth by this government before, but I sincerely can’t believe that a publication as well-respected as National Geographic would publish something like this for any amount of money. This is a government that has lied about inflation statistics – even firing members of the statistics bureau who wished to inform the true numbers – and attacked the free press openly and violently during its entire run. It is a government that has actively attempted to promote ignorance and isolation – everything that National Geographic is supposed to combat. But it seems that this government’s desperate election money was stronger than the principles established for so long. National Geographic has betrayed out trust. But worse, it has betrayed itself.